It's a bit cold here in London (35 degrees upon arrival) for my tastes, but with the pound no longer worth double the dollar (it's closer to 1.5 at last look) it's a great time to take advantage of winter rates on offer at hotels citywide. The Chesterfield Mayfair, the sister property to its namesake in Palm Beach offers a 2-night package from 440GBP that includes two nights' accommodations, two tickets to the theater (you choose the show), drinks when you arrive and daily English breakfast. 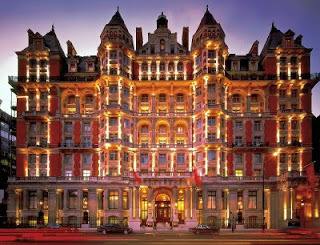 Or, if romance is in the air, surprise your sweetie with a stay at the Mandarin Oriental Hyde Park anytime in February. Rates from just 309 GBP/night include daily breakfast at The Park restaurant, a bottle of Jo Malone Red Roses bath oil and a room scattered with rose petals upon arrival. The best way to get across the pond, in our humble opinion, is on Virgin Atlantic--Upper Class, of course. The individual seat pods are the only we've seen that allow you to recline with your feet up, even upon take off. The entertainment's enough to entertain you the whole flight if you can't sleep, and the fact that the seat coverts to a flat bed, well, need we say more? Contact us today for more information on these and other fabulous luxury London getaways.